I was in Koh Samet , my favourite closest island to Bangkok for a weekend getaway. I took the opportunity to film a short video lesson about inquiring for a room and making a reservation as well as requesting for extra things in the resort. Fortunately a receptionist was so kind to help me making this lesson. Below is the script of our conversation and important vocabulary used during the conversation. Yes, we do. There are three types. We have Beach Front, right now is 3,400. We have Sea View, it is about 2,800. And Superia, it is about 2,500. Then I take a sea view room please. งั้น /ngán/ is a word used when making a decision to choose something. It is put at the start of the sentence. 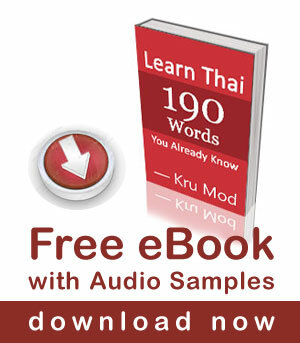 ไม่ทราบ /mâi sâab/ literally means ‘I don’t know (polite term)’. It is also used to put at the beginning of a question in a formal situation i.e. a hotel staff talking to a guest. I’ll stay for three nights. Then please fill names, passports, and sign a name please. รบกวน /rób-guan/ literally means ‘to disturb’. It is also used to put at the beginning of a request when politely asking someone to do something. I would like to request two extra pillows. And two extra towels please. VIDEO: How to Go There? I find your video course on YouTube very useful your method is good and perfect I mean good choices you choose right words and sentences,I think you just need to be a little serious ,thanks. Used to go to Samet most weekends during the mid-90’s, stayed in shack on the beach ( Haad Sai Kaew) for Bt250/night. How times have changed! Usually in resorts khun Mod they speak English to you even if you attempt to ask in Thai – this seems to happen the world over making it very difficult for English speaking people’s to practice the language they are studying unless you go completely off the beaten track. still difficult to recognise classifiers! so odd! I have problems to use classifies in Thai languages. May I suggeste you to post classifies of using with electronic accessories. thank you in advance.